Enterprising People: CarShare Market Manager Dorothy R.
Field of Dreams is more than just a classic movie about the love of baseball — it’s about making dreams reality, and that inspiration has made its way to Southern New Jersey. 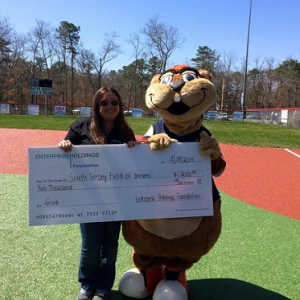 For the past three years, Enterprise employees in the Philadelphia Group have helped the South Jersey Field of Dreams organization write its own script, and the major plotline involves helping individuals with physical and mental disabilities play baseball. At the field where everyone’s a winner, players of all abilities enjoy one of America’s favorite pastimes on a handicap-accessible baseball diamond. With an infield and dugouts that are wheelchair and walker-friendly, the experience is a big hit for players, volunteers and fans alike. Take it from Enterprise CarShare Market Manager Dorothy R., who first pursued volunteer opportunities with the nonprofit group more than three years ago. Not only is giving back important to Dorothy but more and more candidates want to see that Enterprise Holdings is a good corporate citizen, not just a good employer.